Mustang Owners - A breed apart! Not sure how to send a PM, just gives me the option to post on your wall. We are planning on going to the Gate City show (G'Boro) next weekend...plenty of fun going on in the Carolina Chapter so hop on over!! Haha! Yeah, that was me. I bought the car about two weeks ago. I need better tires..hate the pzero's. My car is clean and mostly stock right now, but I'd like to modify it up some. I'll shoot you a text so you have my number. My name's Chris. 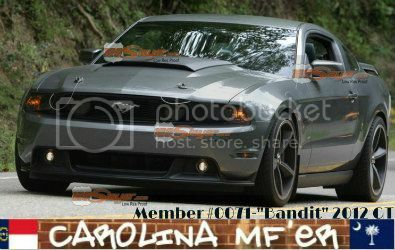 As far as Carolina Chapter..do you mean the Heart of Carolina Mustang Club? I'd love to get involved..its good to finally be back in another Mustang. Hey man..saw you tonight on Cary Parkway..LOVE your car..do you ever go to Cars and Coffee up at brier creek?